This useful Agenda has been designed to be your constant companion, so is not specific to any particular year. Start using it today to help you to institute an attitude of Gratitude. The inspirational daily messages will keep you focused on life’s blessings and encourage you to collect and compose your own positive thoughts. This Agenda is also an ideal place to record birthdays and remember friends and family members who have helped and encouraged you on your journey through life. 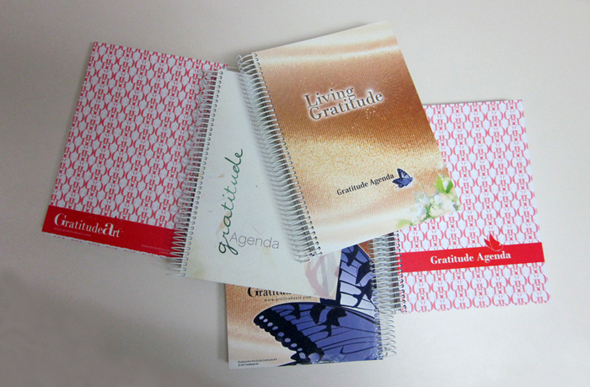 The Gratitude Art Perpetual Agenda is available in three different designs to suit every personality. Intention: The intention of the Gratitude Art Perpetual Agenda is to provide a positive focus – every day of the year – to help you to embrace an attitude of Gratitude and to remind you of the constant presence of a benevolent universe.